Teamspeak is a voice chat server which is very popular in the gaming world. Clans and casual gamers use it to communicate during gameplay, and as it is not tied to one game publisher nor gaming platform (such as Steam, which also has a voice chat feature) so it can be used cross-game and cross-publisher. It is also very easy to set up and create channels, as well as allocate users and blacklist rogue elements or misbehaving players. In addition you can use it for limited number of players for free – up to 32, beyond that there is a licence model for hosting providers and the like. 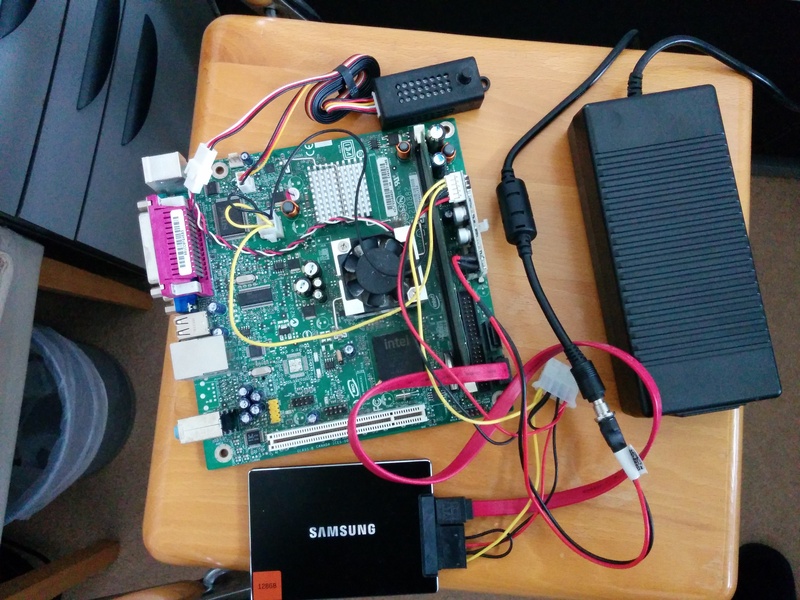 I’d previously run a very small Teamspeak server for my son’s clan on a Atom-based barebones PC, using a mini power supply and a flash hard disk on a SATA connection. 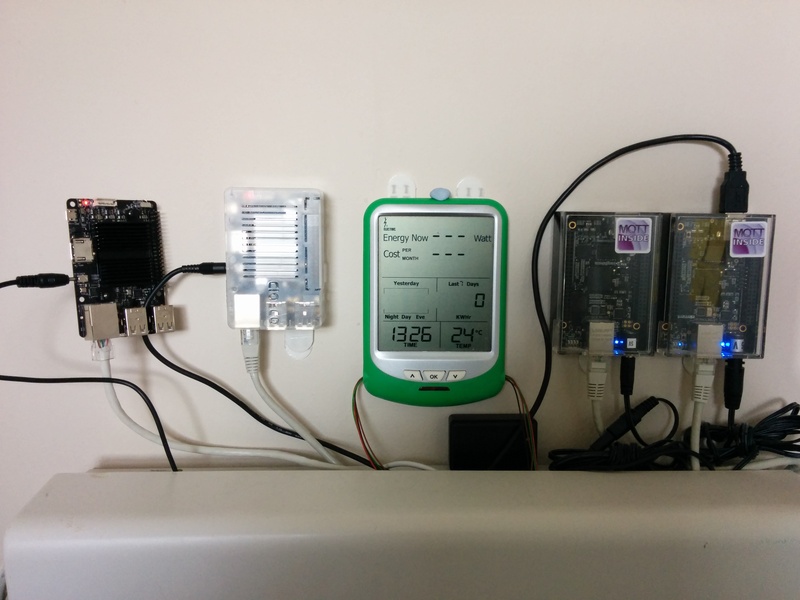 This worked well, but the small CPU hardware fan was annoying until damped down by a speed controller, and the electricity of 20W per day was unnerving, especially if no-one was using the server during the day. That’s it below, and the mess of wires is just how it works. The problem was that Teamspeak only runs on Android/iOS and x86 architectures, there is no compiled binary for ARM architecture and none forthcoming. The endless requests on their forum proved this, and the continual “there are no plans for ARM” didn’t raise any hopes that the company was thinking of compiling their binaries for this platform. Most single-board computers now are running ARM architecture, even though Intel is good it doesn’t have the cachet with the geek community in this space. 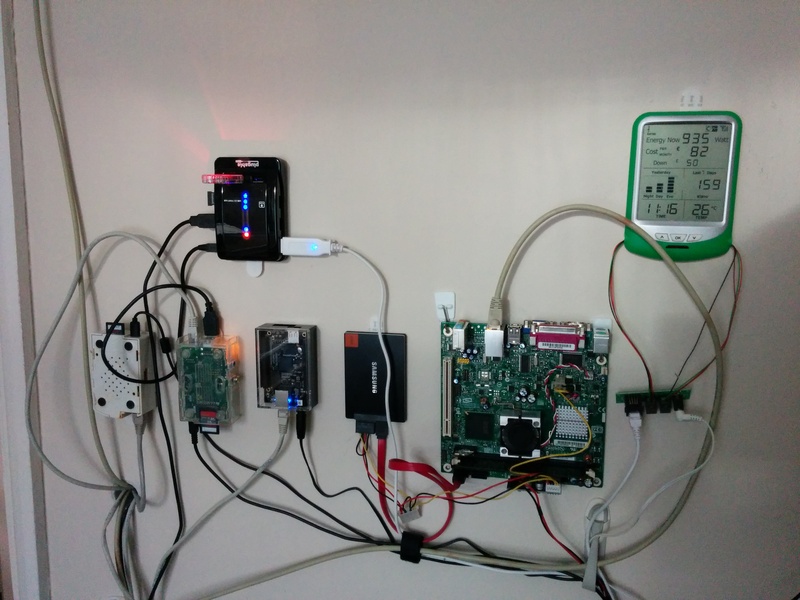 Therefore my wall of Raspberry Pi, Beaglebone Black and Odroid devices wasn’t able to run Teamspeak and I had to have an extra board hanging on the wall with lots of cords. That was, until I discovered Eltechs – a Russian company who specialise in binary translation layers and whose Exagear Desktop was exactly that: a utility which allowed binaries compiled for x86 to run on ARM architecture devices. I’ve now installed Exagear Desktop for about £24 on a single licence, and over a late Sunday afternoon’s coding and configuring got it running! And it runs well! Now, my wall of SBCs looks much neater and has just two BBB running NodeRED and other house control functions, while the Odroid is taking on the Teamspeak server (Odroid seems to have more capable boards than Raspberry Pi or Beaglebone) which it does without breaking into a sweat on its 4-cores, and then alongside is the newer Odroid C2 with a 64-bit architecture and the latest and greatest Ubuntu 16.04. The outcome? Much lower electricity consumption, and a set of always-on servers.